Satellite altimetry data (1993-2017) are used to describe the the Gulf of Mexico (GoM) Loop Current (LC) system. We use the delayed-time, merged/gridded 1/4° sea surface height (SSH) anomalies produced by AVISO+ (www.aviso.altimetry.fr/) and obtained from the E.U. Copernicus Marine Service Information (http://marine.copernicus.eu/). A mean dynamic height of mdt_cnes_cls2013 is added to the sea level anomaly data, and annual cycles are removed to reduce the steric height effect. Geostrophic currents are computed from the gradient of the SSH. A quantitative assesment using the satellite-tracked drifter trajectory observations in the estern Gulf of Mexico show that the altimetry-derived current products performs better than the data assimilative numerical models in providing essential surface current information [Liu et al., 2014]. The altimetry product was used in a series of analyses of the Gulf of Mexico Loop Current patterns by the USF Ocean Circulation Group [Alvera-Azcárate et al., 2009; Liu et al., 2011; Liu et al., 2016a] and the West Florida Shelf offshore forcing index [Liu et al., 2016b]. Recently, the altimetry data were used to study the West Florida Shelf's role of an anchor that affects the LC pentration into the GoM [Weisberg and Liu, 2017]. Alvera-Azcárate, A., A. Barth, and R.H. Weisberg (2009), The surface circulation of the Caribbean Sea and the Gulf of Mexico as inferred from satellite altimetry, Journal of Physical Oceanography, 39, 640-657. Liu, Y., R.H. Weisberg, C. Hu, C. Kovach, and R. Riethmüller (2011), Evolution of the Loop Current system during the Deepwater Horizon oil spill event as observed with drifters and satellites, in Monitoring and Modeling the Deepwater Horizon Oil Spill: A Record-Breaking Enterprise, Geophysical Monograph Series, 195, 91-101, doi:10.1029/2011GM001127. Liu, Y., R.H. Weisberg, S. Vignudelli, and G.T. Mitchum (2014), Evaluation of altimetry-derived surface current products using Lagrangian drifter trajectories in the eastern Gulf of Mexico, J. Geophys. Res., 119, 2827-2842, doi:10.1002/2013JC009710. Liu, Y., R.H., Weisberg, S. Vignudelli, and G.T. Mitchum (2016a), Patterns of the Loop Current system and regions of sea surface height variability in the eastern Gulf of Mexico revealed by the self-organizing maps, Journal of Geophysical Research: Oceans, 121, 2347-2366, http://dx.doi.org/10.1002/2015JC011493. Liu, Y., R.H. Weisberg, J.M. 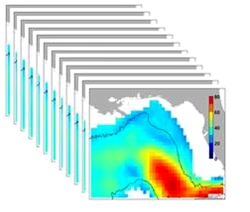 Lenes, L. Zheng, K. Hubbard, and J.J. Walsh (2016b), Offshore forcing on the "pressure point" of the West Florida Shelf: Anomalous upwelling and its influence on harmful algal blooms, Journal of Geophysical Research: Oceans, 121, 5501-5515, http://dx.doi.org/10.1002/2016JC011938. Weisberg, R.H., and Y. Liu (2017), On the Loop Current penetration into the Gulf of Mexico, J. Geophys. Res. Oceans, 122, 9679-9694, http://dx.doi.org/10.1002/2017JC013330. The analyses and data are research products under development. No warranty is made, expressed or implied, regarding accuracy, or regarding the suitability for any particular application. All rights reserved University of South Florida, Ocean Circulation Group. Copyright University of South Florida 2017.